Although my children are all grown, this prayer still struck a chord with me this morning. 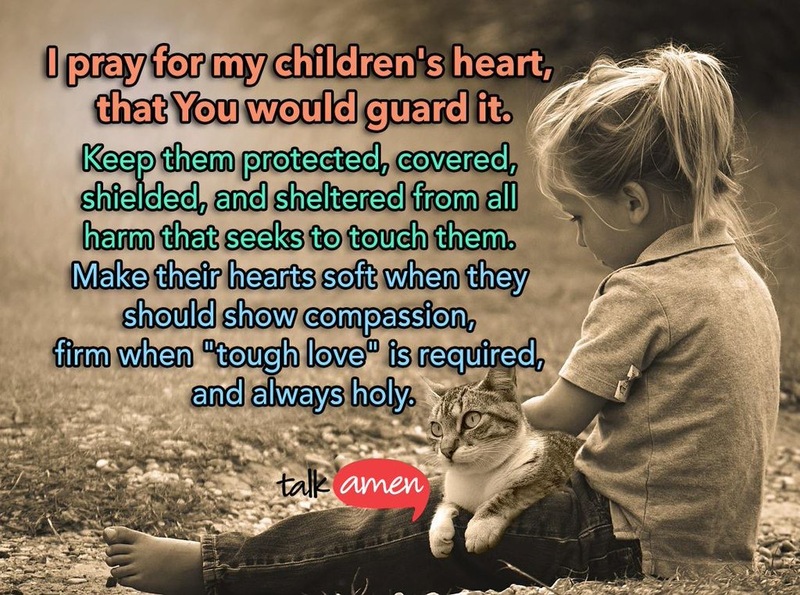 I pray for my childrens’ hearts, that You would guard them. Keep them protected, covered, shielded, and sheltered from all harm that seeks to touch them. Make their hearts soft when they should show compassion, firm when “tough love” is required, and always holy. Fill their hearts with Your love. His descent for the judgement of Doom. I pray that, as you desire to be united with Christ, you may also desire to be united with the members of the church. May you share the same spirit and purpose as your brothers and sisters in Christ. May you contribute to the strengthening of the church by encouraging, edifying, and instructing your brothers and sisters. May you also welcome encouragement, edification and instruction from them. Most of all, may you show you are one with them through your love, for this is how all men will know that you are a true disciple of Christ.